The CACI Jowl Lift has been developed to specifically target muscle laxity around the jawline which can cause drooping jowls and loose skin using “Quad Probes” to give a firmer more toned appearance. 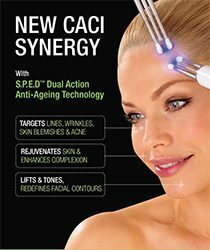 The NEW Eye Revive treatment combines active microcurrent eye rollers, which are infused with CACI Eye Revive Serum, together with a deeply nourishing NEW Hydro Eye Mask to lift hooded eye lids, reduce puffiness and dark circles. Get those lips looking juicy and luscious ready for the weekend or any special occasion! Using the CACI award winning Amino Lift Peptide Complex and electrical stimulation with red LED light therapy to immediately plump the lips.